Are you heading out to the wilderness alone? 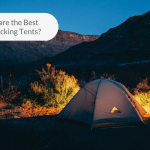 In this article, we will be talking about the best one man tents for you to narrow down your choices for the most reliable and comfortable tents. Backpacking can be a great adventure for the family, but for those solo hikers out there, it’s best to pack for yourself. Starting with your one man tent, this must have for any outdoor excursion is your own personal shelter that can fit yourself and your gear in a protective, not to mention dry, environment. 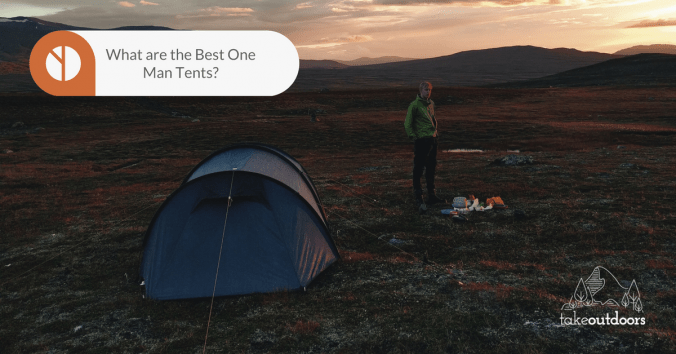 What is a One Man Tent? A one man tent is, as the name suggests, a tent created to house only one person. 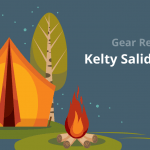 These tents are perfect for solo camping and backpacking trips. The main difference between these tents and 2-4 people tents is their size. They are generally smaller and thus more lightweight. Though they are made to hold only one person, they come in a wide variety of colors, dimensions, styles, and ease of use. 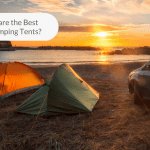 What are the Benefits of a Single Person Tent? There are a few ways in which single person tents stand apart from other camping tents. It depends on what you plan on doing with your tent, but here are a few benefits that might make you reconsider that party-sized tent. Since one man tents are smaller, they are also lighter. The average weight of a single person tent is around three pounds. Weight is an incredibly important factor as a pound or two can make a world of difference in your backpack. Your hiking load will weigh less overall and be easier for you to carry. When traveling by yourself, there is no need to opt for a large tent. A one man tent will not only be easier to carry but also all around better for a solo traveler. These tents are more compact and usually require less time and energy when setting up. This is ideal after a long day of hiking. One man tents provide a lot of comfort for their inhabitants. Usually, there is not even a need to use a sleeping mat or pad. Due to their size and the amount of material needed to create them, these tents generally cost less than other, larger tents. This is a real plus. One person tents, like all tents, are available in a few different shapes. Each configuration has its own advantages and disadvantages. Here are a few of the most common single person tent shapes. A-frame tents are designed with sloping walls so that, for the outside, it looks like the letter A. These tents are simple, lightweight, and rather inexpensive. However, because of their design, your head and arm space are limited. Also, they are not ideal for windy and otherwise bad weather conditions due to their broad walls. Often called tunnel or tube tents, the hoop tents usually provide a fair amount of weather resistance. They are also fairly lightweight. However, they are not freestanding which means they will need more staking to keep their shape and remain effective. Wedge shaped tents have a higher ceiling height towards the head end and lower towards the feet end. These tents are great for windy conditions and are very lightweight. The only downside is the not spacious interior. Here are a few factors to take into consideration when picking out the best one man tents. The seasonality of a tent tells you what seasons the tent will fare best in. There are summer tents, three season tents (which do not work well in the winter), and four season tents (which work well all year long). This is especially important for tall people. Even though all of these tents are made to hold one person, they have different dimensions. Some offer more space than others. If you plan on using this tent for long hiking or backpacking trips, the weight will be very important. Generally, these tents weigh around three to five pounds. This includes the materials used to make the tent and the material used to create the poles. Knowing the material will let you know how sturdy and durable the tent will be when set. The material also contributes to the weather protection. There is nothing worse than a leaky tent. When camping, you want a tent that can withstand cold, rain, wind, and possibly snow, if you plan on camping in the winter. The ease of use also includes how difficult the tent is to set up and take down. If you’re looking for a lightweight but extremely durable tent, the Hilleberg Akto 1 Man Tent would make the perfect fit. Optimized for gear storage while still providing room to dry your boots from your hike, the tent still offers plenty of sleeping bag room for one person. The frame is built from 9mm poles which are incredibly durable for either light rain or harsher winds. Another key feature is how quickly you can set-up and take down the tent which is perfect for hikers on a tight itinerary. You will also notice a variety of vents for circulation and an exterior tent poncho for inclement weather. 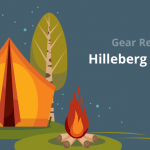 Believe it or not, the Hilleberg Akto is ranked one of the best solo backpacking tents in the world as well as one of the lightest 4 season tents. 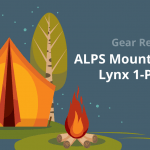 The ALPS Mountaineering Lynx tent offers one of the most impressive amounts of ventilation of one person tents making it a perfect fit for summer hikers. With easy one door entry and weather treated fly and door seals, you’ll never have to worry about tracking in unwanted dirt entering your sleeping quarters. Also, the ALPS tent sports half mesh walls for increased ventilation to help keep you cool and dry throughout the night. Not to mention, the tent is super lightweight and durable to help you throughout the backpacking trip despite most weather conditions. In addition, the tent itself weighs under 4 pounds which make regular hikes with it easy and less strenuous than bulkier tents on the market. The Winterial Single Person Tent is not only easy to assemble but also lightweight to make for the best backpacking tent for your next outdoor excursion. This three season tent has a ventilated and mesh roof to add more breathability, including a rain fly for rainier conditions. Its light weight of under 3 pounds makes it also incredibly easy to pack for longer hiking trips. Along with its key features, it also includes a larger zippered door for bringing in larger day packs. Your tent also includes 3 bundles of rope with stakes to safely secure it during inclement weather. If you’re looking for a simplistic tent with a small and lightweight boy, the Snugpak Ionosphere might just be the one for you. With a strong frame built with a waterproof flysheet to protect the exterior of the tent, it is the perfect fit for harsher weather conditions. In addition, the tent is fully equipped with a repair kit for any wear and tear during your hikes. The Ozark Trail tent is the perfect tool for solo hikers with plenty of room for your gear. Built from a 2 pole design that can easily fit in your backpack for longer hikes, it also only weighs 4.4 pounds making it incredibly lightweight. Not to mention, an easy setup with interior organizers with gear loft for plenty of room for yourself, your sleeping bag, and more. One man tents make the perfect tool for solo hikers or those who prefer sleeping alone. They are notoriously lightweight and easy to setup making it easier for exhausted hikers to set up camp. Among the 5 we reviewed, the best one for hiking excursions is the Winterial Single Person Tent. Winternal Single Person Tent is not only one of the most lightweight out of the bunch but offers a durable and waterproof rainfly. Coming with an affordable price point, you are getting a lot of value from this tent.